Cleveland, OH - Once you decide to turn your holiday lighting chores over to a professional company, the next question is which company to choose. There are many holiday lighting companies out there, but your experience, satisfaction, and enjoyment of the holidays depend on the quality of that company. The idea behind hiring out this work is to not have to worry about your outdoor holiday decorating. You don't want to trade doing the work yourself for babysitting unqualified workers. You just want to turn the job over, go about your holidays, and know the work will be done beautifully. To help you sort through the myriad of holiday lighting companies, we've put together a guide to help you discriminate between the amateurs and the professionals. As you do your research, make sure you ask the following questions. 1. How long have you been installing holiday lighting? This sounds like an obvious question, but you'll notice differences between jobs completed by long-time professionals and brand new ones. As with anything, the more experience you have doing something, the more professionally you can do it. Holiday lighting companies with years of experience have more design depth, and they accomplish the work quicker and more easily. 2. How many homes have you decorated? It's important to ask this question, too, because a company could have started installing holiday lighting 12 years ago but only worked on 1 house all those years. When a company takes care of many homes during the holiday season, they have wider experience and can draw on many different design ideas when coming up with the perfect design for your home. 3. Where is your office located? 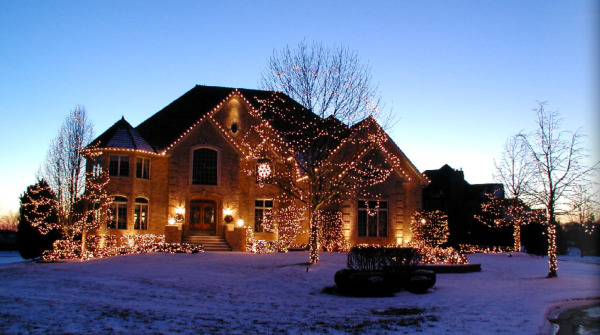 It's best to choose a holiday lighting company whose office is in your local area. That way, you know they are well aware of local lighting rules and traditions, and if they store your decorations, they'll be near your home. 4. Do you install professional-grade products? Do you have a catalog? One of the benefits of using a professional lighting company is that you'll save money in the long run on purchasing holiday decorations--if they offer professional-grade products, that is. Offering a catalog lets you be a part of the design process, and that's important. After all, it's your home that's being decorated, and the design should reflect your personality and lifestyle. 5. Do you have a list of current lighting customers? Any company worth its salt will offer you a list of current customers as references. Go ahead and contact these customers and ask them if they're satisfied with the company's work. Ask if the workers show up on time, if the products are good quality, if they're pleased with the lighting scheme, and if they've ever had any problems. Talking to other customers will give you peace of mind and help you to know if this is a company you can trust. 6. Do you maintain the holiday display? Even though you don't have to put the decorations up yourself, there's still maintenance to think about. Will they replace bulbs during the holiday season or come to the home if there's a problem? 7. Do you store decorations in a climate-controlled storage facility? Your holiday decorations will last many, many years if they're properly stored. Insist on climate-controlled storage. You can tell a lot by how companies answer these questions. We know we can answer them well, and we hope you call and ask us these tough-hitting questions. We aim to make your holiday season as enjoyable and worry-free as possible. But don't take our word for it; check us out.